One of the most popular forms of Azeri poetry is the "bayati", which is a traditional genre of lyrical poetry. It is considered to be a folk literary genre. The tone of bayatis here is reflective, introspective and mournful - like laments - which express the heartbreak and concerns of the people. Typically, bayatis are best known in oral performance - not written - form. These bayatis were collected by Ahmad Jafarzade between 1955-1956 while he was imprisoned in hard labor prison camp in Siberia. Ahmad has identified the person who recited these works by name, date of birth, and village or town of origin. Unfortunately, we have no other information about these individuals. Nor do we know if they actually composed these bayatis, or whether they had merely heard them, memorized and shared them with Ahmad as poetic expressions reflecting their own sentiments. Ahmed collected all of these bayatis from men; though women, too, are very involved in the creation and recitation of this popular genre. Bayatis follow very strict stylistic rules. Each verse consists of four lines with seven syllables. The third line is based on free verse, while the other three lines must rhyme. The main idea of the poem is always encapsulated in the last two lines. Ahmad's collection was hand written in a copybook, which is now in the possession of his nephew Turan Ibrahimov who passed them to us. The cover reads (in Russian): "Materials of Verbal Folk Art" (collected from among the prisoners in Camp 137/52 of the Unjlag Ministry of Internal Affairs) 1955-1956. Left: Prison camp at Tayshet in Siberia, 1955. 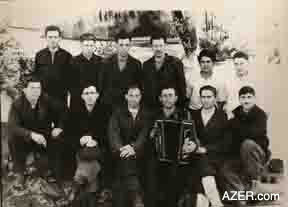 Ahmad organized an ensemble of song and dance in prison as he had a theater background from Baku. Later on, this Siberian performance group became well known in the Soviet Union but it started among prisoners led by Ahmad. Fortunately for us, these bayatis passed censorship, despite how critical they are of the conditions under which prisoners were kept. The censor's notes read (in Russian): "No forbidden notes. Compilation is purely of amateur interest." June 17, 1956. Signed: Chief Censor I.S. Molafayev. Translator P.A. Avakyan [an Armenian who obviously knew Azeri and had translated these bayatis into Russian so that censors could understand their content]. This is the first time these bayatis have ever been published; therefore, we are making them available for both our Azeri and English readers. The translation from Azeri into English was done by Gulnar Aydamirova; editing by Betty Blair. Note that in English, these bayatis lose their rhyme and rhythm but still the reader gets an idea of the content. The following bayatis were told by Aghamirza Vali oghlu Dadashov, a peasant born in 1916, who came from Padar village, Shamakhi region of Azerbaijan. Maybe it really is a grave. Who can't recognize the prisoner? Whose hands are in chains. In both bad and difficult days. I'm a prisoner all my life. And the road leads to Shirvan. I'm in love with Arzurum. Having to endure every difficulty. And made me drink poison. I would let Him know what He doesn't know. With which He wrote my fate. The poison that you have made me drink. My Koran and my charaka. Someone is miserable, waiting for me. Shaki has people crying for it.